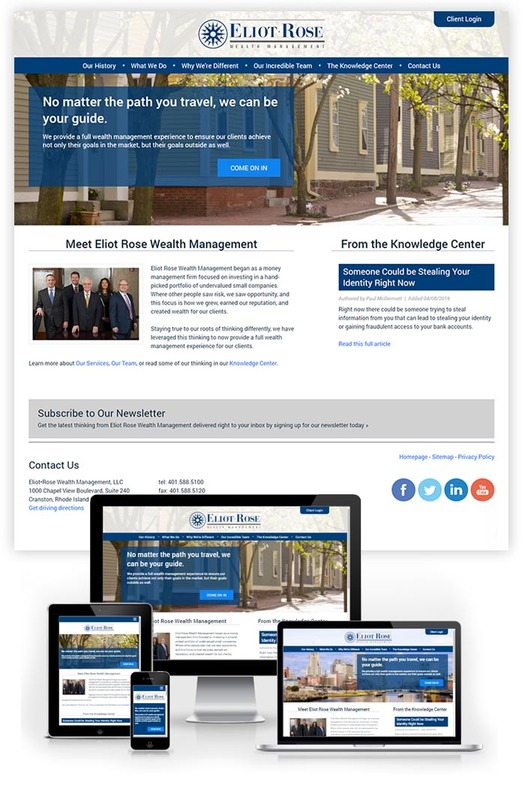 Eliot Rose Wealth Management has relied upon Envision Technology Advisors for technology consulting services, including website design and development, for many years. In fact, Envision had designed the company’s 2 sites prior to this latest version, so there was a significant level of familiarity between the two organizations. On a personal level, I led the previous website redesign project for Eliot Rose close to 4 years ago. Even though that site was still looking good, changes in the organization’s offerings and how they wanted to present themselves made a redesign the right course of action for their needs. The company also wanted to start publishing regularly to the site in the form of a blog, so a move to a CMS (ExpressionEngine) was also part of this project. I ended up managing this overall engagement and also contributing the initial design work for the new site. Other team members at Envision handled some of the design work for interior pages of the site, along with the HTML/CSS development and CMS integration. All in all this was a pretty straightforward project for a long-time client who wanted a nice, clean design and a site that they could easily manage going forward. You can view the new website at www.EliotRose.com.